Agnete and the Merman? Who could that be? 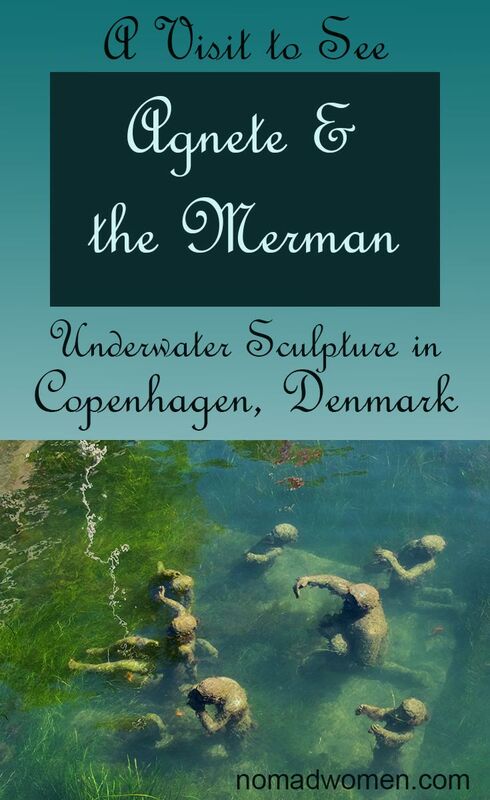 A Danish folklore ballad inspired a statue that proves that the famous Little Mermaid is not the only “mer-life” statue that should go on your Things to See in Copenhagen list. Every visitor to Copenhagen knows about and wants to see The Little Mermaid, perched so delicately on her rock at the water’s edge along Langelinie promenade. The Hans Christian Anderson-inspired mermaid has been an iconic tourist attraction in the city for more than a hundred years. She is an intrinsic part of the fairytale that Copenhagen seems to bring to life. But mermaids and mermen are numerous in Danish myth, legend, and fairytale. And there is another statue you can see… assuming the water is smooth and the sun is right. Because Agnete and the Merman is underwater. And Agnete herself is missing. 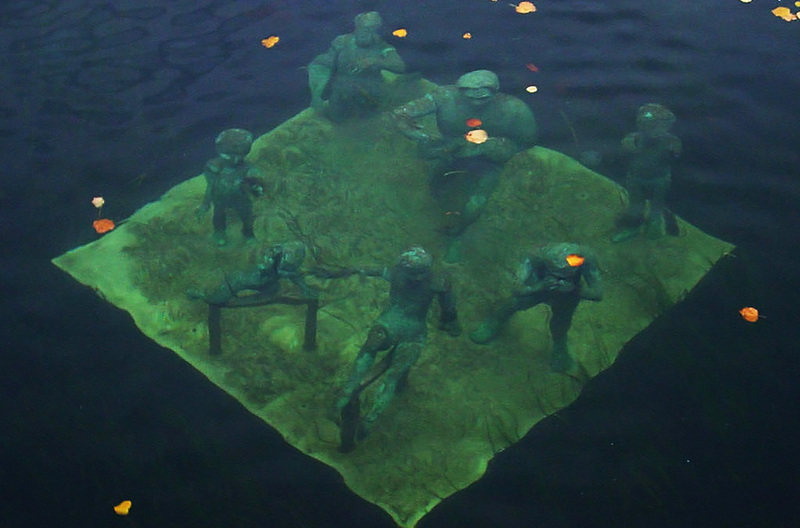 Inspired by a traditional Scandinavian ballad, the grouping of statues, cast in bronze and positioned on a bronze platform, sits just under the surface of the water in Copenhagen’s shallow Slotsholm Canal, right next to the Højbro Bridge. As I said, Agnete herself is not part of the group, and therein lies the tale, which some say dates back to medieval folklore. As the legend goes, Agnete was a pretty, young village girl. One day, as she was walking alongside the water, a merman emerged from the waves. He must have been a handsome devil, because she was instantly smitten with him. The feeling was mutual. When he asked for her hand, the girl, all thought of her home and chores and family flying from her head, immediately accepted and went into the water to live with the merman. And there they lived happily ever after… or at least long enough for her to give birth to seven mer-sons. One day, perhaps swimming too near the surface, Agnete heard the ringing of the church bells wafting from the land. She was struck with homesickness and begged the merman to allow her to go to church. Reluctantly, he consented, making her promise to return right after the service. At the church, Agnete saw her mother. She learned that the church bells were ringing for the funeral of her father, who had died from sorrow after unsuccessfully searching for her for so many years. Once back on land, she seemed to forget her love for the merman and her children and decided to stay and return to her landed life. In some versions of the folktale, the merman comes to the church to plead with her, telling her that her children are crying for her. But she blithely brushes him aside and leaves with her mother to return to her earlier life. The suddenly single mer-dad returns to the sea and his children, never to see Agnete again. But her water-logged family never stops missing her. 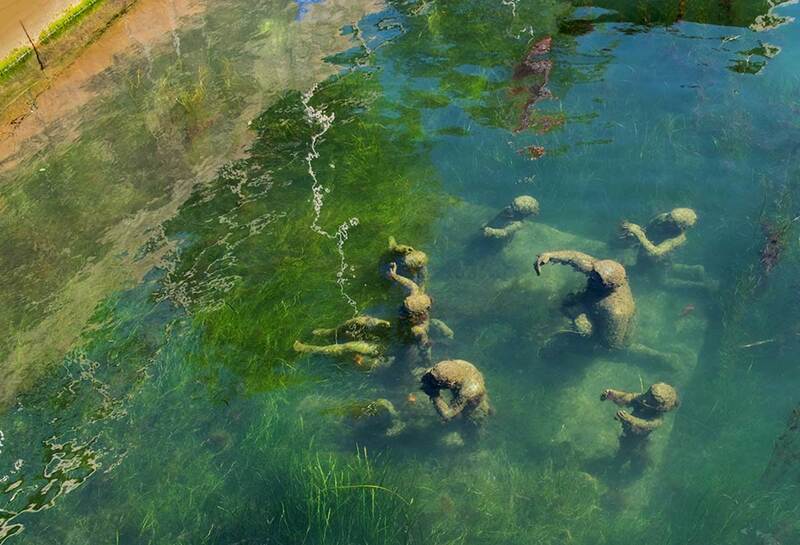 Danish sculptor Suste Bonnen, who created the sculpture grouping in 1992, used bronze to tell the story of their loss and fittingly placed the figures under the water. With palpable anguish and longing, the merman and his sad children stand there among the reeds and waving mosses. Some bury their faces in their hands or arms; others reach toward the surface of the water, pleading endlessly for the return of their mama. With the swirling, rippling surface of the water, sometimes milky with reflected clouds, often hazy and almost covering the view so it is seen like a fleeting memory, the Slotsholm Canal is the perfect setting for this ancient tale of love and loss. Grasses and reeds swirl around their feet as Agnete’s children raise their arms, pleading for their mother’s return. It’s easy to miss the statue retelling the story of Agnete and the Merman if you don’t know it’s there. You will, after all, likely be enthralled by the site of the nearby Christiansborg Palace. Also, dozens of tour boats pass right by the statue every day, keeping the water rippled and churned. But it’s worth standing on the bridge awhile, if necessary, waiting for the water to still, or the sunlight to shift a degree or two so you can bring the poor merman and his lonely children into clear view. I would have missed this Danish treasure entirely except for the fact that I was on a walking tour with a really good guide. He pointed out the sculpture and retold the folktale. It’s just more proof for me that a city walking tour is one of the best ways to be introduced to a new city. You can find a good Copenhagen walking tour here. In the evenings, which are lovely in Copenhagen if you visit in summer, the statue is lit a ghostly blue-green, or sometimes golden yellow. Somehow, the darkness, the streetlights reflected on the water’s surface, dancing gay and golden, make the statues even more poignant. 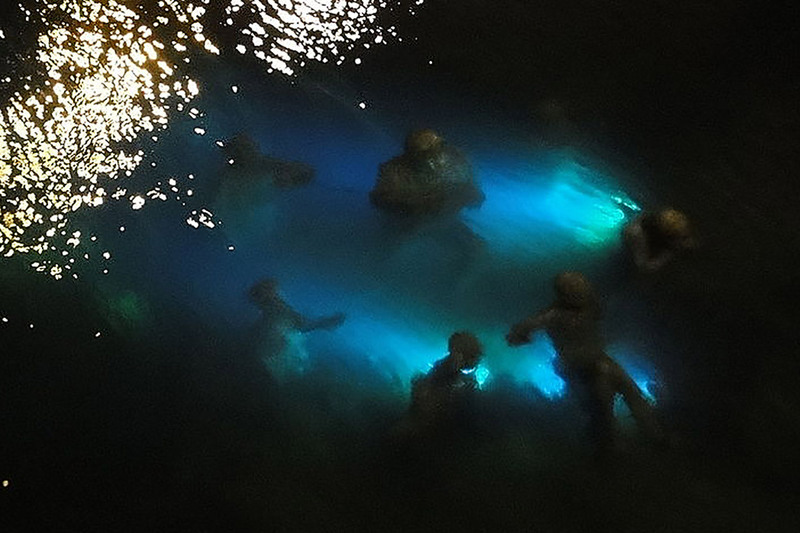 The figures seem to undulate, keening in the glow of the underwater lights. keen in the undulating movement of the glowing lights. Photo by Nettadi: Creative Commons License. There’s a very good chance that when you get home from your trip to Copenhagen and talk to friends who have also visited this fairytale city, they’ll mention the Little Mermaid or Tivoli or Nyhavn. Visits to these iconic sites are wonderful things to do in Copenhagen. You should definitely have them on your list. But when you recount the tale of Agnete and the Merman, you’ll likely be the only one to have seen the mourning family that lives under the water. And your friends will be hoping they can go back to the fairytale city to see this most unusual of things to do in Copenhagen. They will want to visit the emblem of longing for themselves. These are affiliate links. That simply means if you click on a link and make a purchase, I receive a small commission. I only place affiliate links to products and services I believe in and genuinely recommend. I’d love to see this in person! So cool. What an excellent post young lady! I haven’t had the pleasure of visiting Copenhagen yet. I have a friend who lives there now with my old company and has invited us to see him, when we are in Europe after my wife retires. I will definitely add this to our list of things to do when we visit eventually. Thanks for sharing! Thanks Mike. You will love copenhagen. Really. And the great thing about that sculpture is that it is so central that even if the water is roiled, making it hard to see, it’s easy to go back at another time. You and Kim are going to have great adventures when she retires. Fascinating post! I previously knew nothing about Agnete & the Merman. One more reason to visit Copenhagen. Thanks Doreen. I had never heard of it either and would have missed it but for that walking tour guide. It’s worth seeing. Enjoyed reading your telling of the fairy tale. Will definitely have to look for this when I get to Copenhagen. Thanks Rose. It is worth looking for. And easy to do since it is right in the center, near the palace. What a cool place! I’ll definitely have to add this to my list! A great article. I like the legends around interesting art. 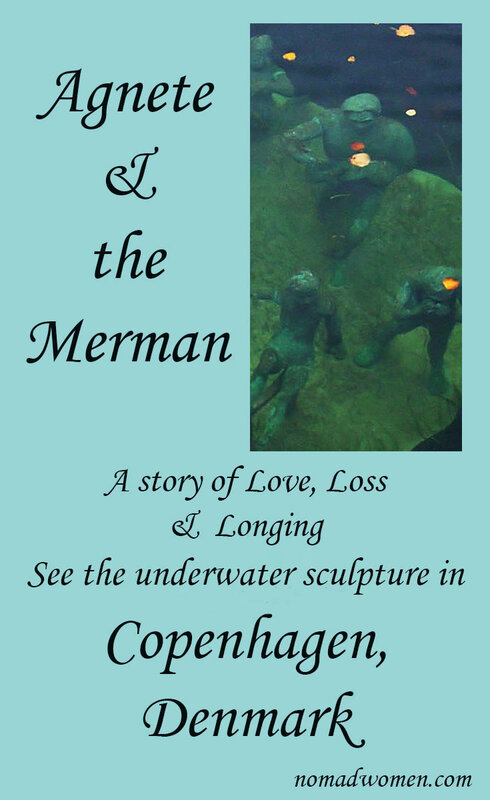 I haven’t been to Copenhagen for years, definitely a reason to go back and look for Agnete and the merman. Thanks so much, Ursula. I love knowing this kind of thing too. I would have missed it if it had not been pointed out by our walking tour guide. I hope you get back to Copenhagen soon. Such a great post. I hope that one day I could have a chance to visit Denmark. I love this country because of its various cultural and beautiful sightseeing. I also have some Danish friends, who are very nice and friendly. I’m sure that my experience there will be one of the most memorable moments in my life. Thank you. This place indeed looks a great place to visit. Thanks for sharing this great info! What great suggestions! And I think I would like to be anywhere in Demark for this Christmas. Oh yes, Denmark for Christmas would be lovely!